By the turn of the 1980s had largely faded back in to obscurity. The Wurzels never stopped performing, but record releases during the 1980s and 1990s were limited to even more obscure novelty singles like I Hate JR, Sunny Weston-super-Mare, and I Want To Be An Eddie Stobart Driver. This latter single (1995) from Loose Records.com got in the UK Top 100 and appeared also as a limited edition lorry shaped disc. 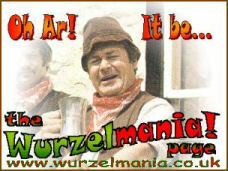 The interest in this record sparked off renewed interest in The Wurzels.